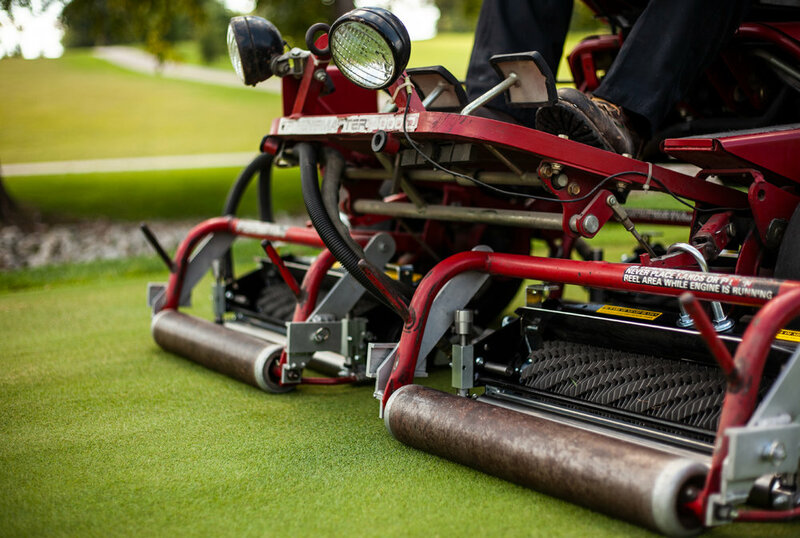 Greens Care Collection — True-Surface® by Turfline, Inc.
ALL INCLUSIVE TURF MAINTENANCE EQUIPMENT. True-Surface® presents turf maintenance equipment that finally works for your budget and your greens. The Greens Care Collection is designed to make your greens care program fast and easy while still keeping your budget fat. Become more energy efficient with the collection that is fast and easy to use. Sturdy Frame Design – Unlike other interchangeable systems, True-Surface® is not compromised by a flimsy clam-shell design. The Greens Care Collection frame is designed to withstand golf course conditions, such as weather, shop floors, and chemicals. Easy-to-use Depth of Cut Site Gauge – No more counting “clicks” and turns; the True-Surface® Depth of Cut Adjuster has a Site Gauge that allows you to quickly adjust your settings by simply choosing your mark. Time Saver – Change out your inserts without detaching the Greens Care Collection from your greens mower. Interchangeable Inserts – The True-Surface® Greens Care Collection will do what would normally take multiple types of equipment to perform. Stop buying expensive equipment – just start your collection of greens care inserts! There is no need to buy a bunch of expensive tools to perform the same tasks that the Greens Care Collection does itself! Save time and money by investing in True-Surface®. The Greens Care Collection (GCC) consists of three frames that attach directly to your existing triplex greens mower. Each frame has the ability to switch out from 13 different inserts. Each insert represents a different greens maintenance tool – making the GCC an all-inclusive product. 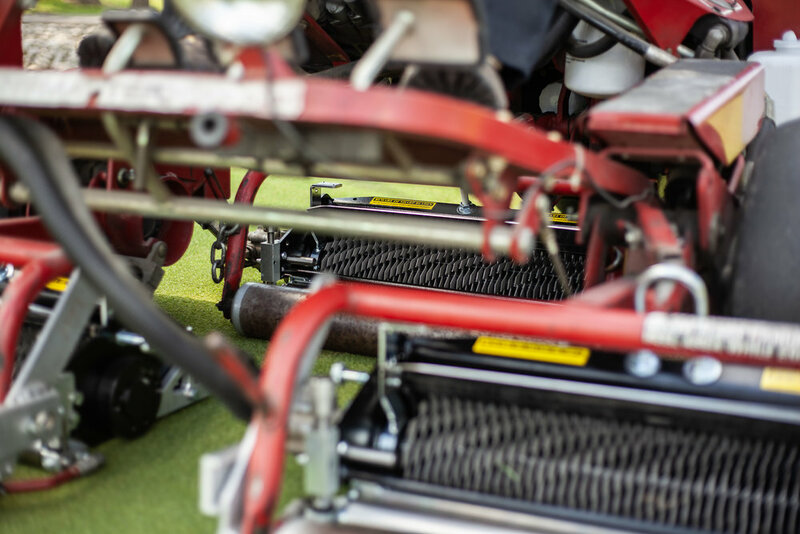 With 13 interchangeable inserts, the Greens Care Collection will transform from a de-thatching machine, to a turf sweeper, and then again to a greens aerator or even a turf groomer. Easily switch from 13 different tasks! The Greens Care Collection provides 12 different greens care cultural practices – why wouldn’t you want one on your course? Call today to see the benefits of the GCC by scheduling your demo. The Vacu-Cutter™ insert is the ultimate de-thatching machine that removes and vacuums up 20 times more material than standard OEM verticutters. Its vacuum-power system shoots the material directly into the grass basket without additional clean-up. Two models are available — a standard 45-blade and a less aggressive 32-blade. The 32-blade provides more spacing between each blade, and has a lighter option for verticutting. Blade Types: steel blades with 11 tungsten carbide tips on each. Everyone wants a nice even cut when they mow their greens. We suggest using the Vacu-Groomer™ insert to stand up the grass prior to mowing to get the most even cut possible. Additionally, the Vacu-Groomer™ is an effective tool for removing poa annua seedheads. Blade Type: 45 steel blades with 2 tungsten carbide tips on each. Blade tips are offset so they can cut at ¼” (5mm). For times when you need to cut in a little deeper you will need to utilize the Vacu-Scarifier™ Insert. The True-Surface® Vacu-Scarifier™ is a useful supplement to regular use of the Vacu-Cutter™. It removes large amounts of thatch and opens the surface for entry of air, sand topdressing, water, and pesticides – not only leaving your greens healthy, but also immediately ready for play. Blade Type: 12 steel blades with 5 tungsten carbide tips on each. The NEWEST addition to the GCC is the Vertical Mower insert! It is equipped with a revolutionary blade that is especially useful with ultradwarf bermuda grasses. The True-Surface® Vertical Mower will thin out horizontal growth by cutting perpendicular to the solid surface. Insert is available with either 23-Blades or 44-Blades. Blade Type: 11-tip vertical cutting blade. Each Insert consists of 23 or 44 non-carbide tip blades, with a Rockwell C hardness of 55. Preparation is an important aspect to any turf maintenance program. 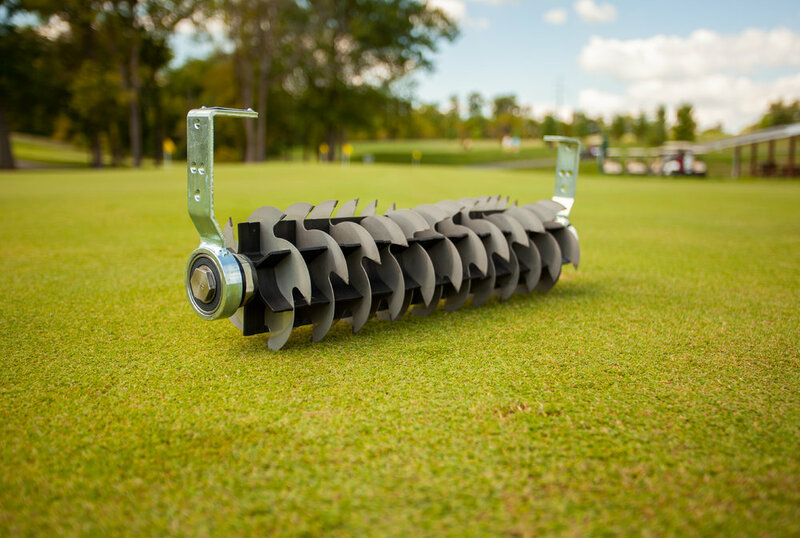 With the Greens Spiker you are able to prep your greens for overseeding with only two or three passes – saving you time! 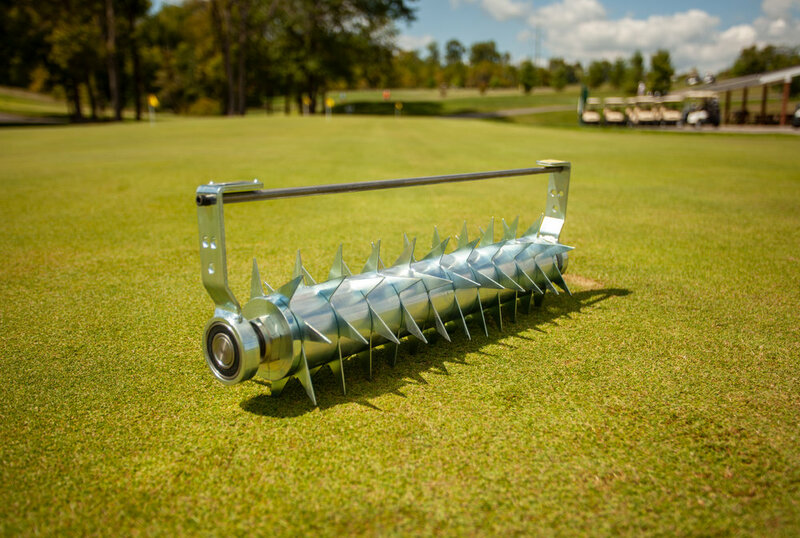 The Greens Spiker uses its spikes to penetrate through the greens’ surface to allow air and water entry – also making it a great tool for venting during high humidity months! The Star Slitter is used as a turf aerator tool. 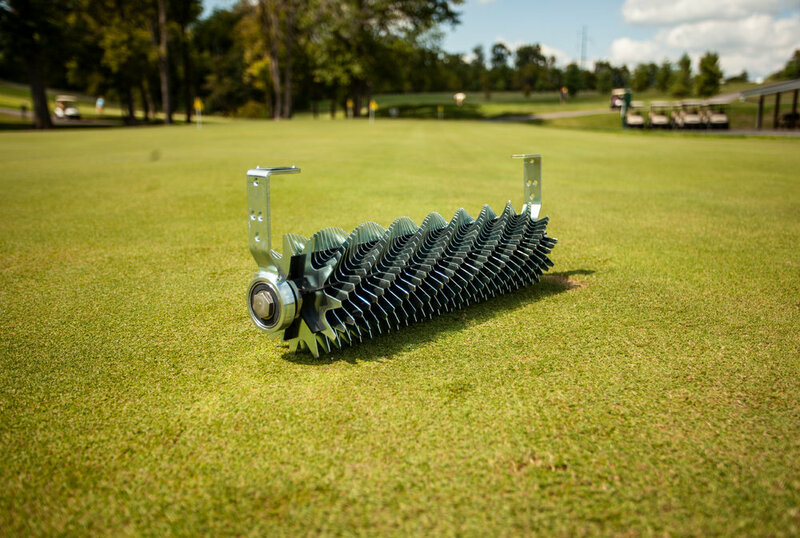 Use the Star Slitter Insert for a fast and easy way to aerate the surface of the green without disrupting it. It will leave the surface smooth and ready for play. Open your greens surface without removing any material! Use the Deep Slicer insert to create deep, continuous slits in the green to allow gas exchange, water penetration and stimulate root growth. The blades are designed to open the turf without removing material – leaving your greens immediately ready for play. 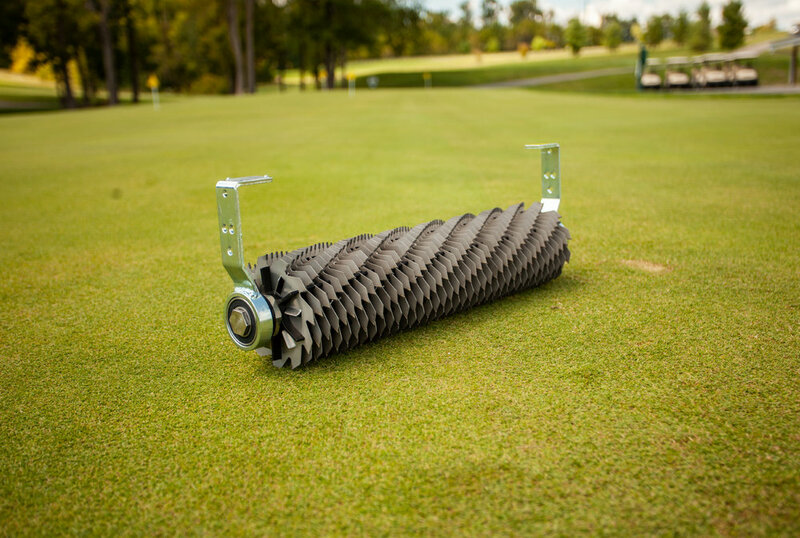 Use the True-Surface® NV Roller insert as a non-vibratory option to greens rolling at a lower cost. Greens rolling will help you gain green speeds, smooth the turf, and raise your mowing height of cut. We like to provide options for our customers, so we now have three types of Vacu-Brushes™ available for different applications. Use our firm brush to groom the turf, collect large debris, and remove poa annua seeds along with excess topdressing. To incorporate sand topdressing, remove your mower’s grass baskets and use the Vacu-Brush™ to work the sand into the canopy. Usual Working Depth: 0 – Bristles should just lightly skim the top of the turf. We like to provide options for our customers, so we now have three types of Vacu-Brushes™ available for different applications. Use the soft or the super soft brushes to remove dew, surface debris, and worm castings. Give us up to three dates that work best for you to meet, in person, for a demo of one of our products. Thank you for requesting a demo. We will personally review your submission and respond as soon as we can.